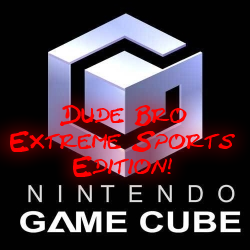 Stuck On A (Game)Cube: Dude Bro Extreme Sports Edition! "Gather yee, gather yee for tales of generations past. Jeopardizing my excellent stance with my TAY sisters, this week's edition of SOAGC (I <3 acronyms!) is all about sports. Not regular sports mind, those are terribly boring. These are the extreme variety, the ones that make all the dude bros flock in front of a GameCube and spend many happy days screaming and throwing popcorns at the TV screen with the occasional dude bro rumble halfway for good measure. " … Shaolin Soccer's Unofficial Video Game Adaptation! Keep your FIFAs and Pro Evolution Soccers, "RedCard Soccer" is where it's at. Be prepared to see a lot of Midway on this week's feature. The title is quite misleading since the entire point of the game is to actually play without the referee pulling a red card which would expel a player for improper or violent behaviour. And boy, do we have a lot of both right here! Forget the regular tackles, flying jump kicks to the chest and back is the proper way to play this. You will eventually fill the special moves bar and what that is topped, shooting at goal becomes like something out of "The Matrix" and "Shaolin Soccer" with bullet time, over the top kicks that would seem to be more at home in Kunio's "Nintendo World Cup" series. By the time you start playing against teams of Ninjas, SWAT forces, Dolphins and even Martians, you have already accepted the madness and are in too deep to ever be able to play a regular football game again without getting bored. … This Ain't No "Virtua Striker"! … Peach in Short Shorts! …in you're into that sort of thing. Know in America as "Super Mario Strikers", I prefer to call it by its European name "Mario Smash Football". Co-developed between Next Level Games and Nintendo, this fantastic game grabs the core concept of "SEGA Soccer Slam" and plasters it inside the Mushroom Kingdom, including the odd appearance of Bowser mid game and all the familiar weapons of "Mario Kart". This actually remains a more "pure" game than its sequel on Wii, itself a fantastic game. Wonderful stadiums with their own hazards, the over the top celebrations of players when they score a goal and the fact no one seems to care that Donkey Kong keeps playing with his hands really makes me wish Next Level Games brings out a new entry in the series on Wii U or 3DS. Let's hope that happens in the near future. … Folding Chairs, Ladders and The Spanish Announcers Table! Is this a sport? I don't care, I'm talking about it here anyway. Wrestling isn't fake. Wrestling is scripted! There is a difference, people! And we know those guys out there don't make nearly enough money for the things they do to their bodies to entertain us. Thankfully in video games no one gets hurt so we are free to put their virtual counterparts through hell and back. Besides the excellent 2D "Fire Pro Wrestling ", only Nintendo 64's "Virtual Pro Wrestling " series managed to get the core fun aspect of wrestling right. So it was a good thing that Yuke's managed to produce "Day of Reckoning" based on its excellent template. Every 3D wrestling game made after this up to this days remains subpar. Excellent game mechanics, tons of modes and the essential CAW (Create a Wrestler) mode ensure this is even today an amazing multiplayer experience. Having this and its sequel in your GameCube library will do no one any harm unless you have some really bad bro dude friends who might start an actual TLC match in your living room should you eject their player out of the ring mid Royal Rumble. In case you are wondering, yes I did follow a lot of wrestling, from the early days of WWF to the NWO/WCW Monday Night Wars all the way to the current WWE as it remains today, but the whole tragedy with my favourite all time wrestler Chris Benoit murder/suicide affair back in 2007 made me move on to other things. …The Coolest Game On Earth! "NHL Hitz 2002" saw more multiplayer game time around here than "Super Smash Bros Melee" and "Mario Kart Double Dash" combined. We spent hours, afternoons, days, MONTHS playing the hell out of this one. 3-on-3 (+1 goaltender) fast paced arcade, no injuries Ice Hockey is what's on the menu. Now you might think "oh sure, look at the Ice Hockey fanboys raving on!" but know this: There is absolutely no tradition of Ice Hockey in Portugal! We played the heck out of this because it's super addictive and extremely fun! An excellent "create a team" career mode gave birth to the legendary "Lisbon Warriors" franchise: Dragon, Galahad, Gunner and in the net 101011! I still maintain my personal record of over 100(!) hits in a single game (I pretty much ignored the puck the whole game). Putting an unaware adversary trough the protection glass is as fun today as it was a decade ago. "NHL Hitz 2003" is an even superior game with further tweaks to the winning formula and even more fantasy teams and new weird heads to put on the "create a player" mode. An amazing job yet again by Next Level Games in taking the crow out of EA's NHL series with the last entry of the series, the 5-on-5 "NHL Hitz Pro" where things are taken slightly more serious, but you can pretty much remove all the rules and make the game as chaotic as the previous titles. If you've never played this, you are missing out! Go grab it right now! Works best with like-minded bro dude friends! … Everyone Eventually Grew Up! And sadly so did the industry. All my friends as expected got jobs, got married, have children so it's really hard to meet up and spend hours blasting pucks past the opponent goalies or blitzing quarterbacks. But what truly is worse, even after the successful "NBA Jam" reboot no one is making these type of games any more! Even Nintendo itself is wasting the talent of Next Level Games for a long overdue NES "Ice Hockey "reboot, still one of the best multiplayer games ever made. I shall continue to lobby so for that to happen on Next Level Games Facebook page. Fingers crossed for the future of arcade, over the top violent contact sports! Until next time and if I manage to pull myself away from "NHL Hitz 2003": Play Hard, Play LOUD! Do you even lift?